Step on the brake pedal like you would normally do to start the car. 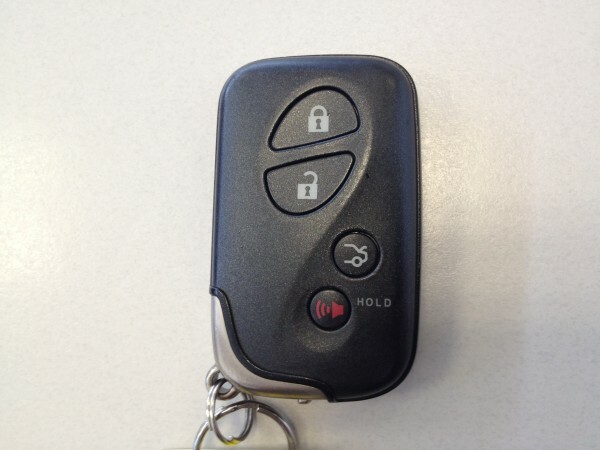 Hold the key remote up to the push button ignition. The light on the start button will turn from orange to green. Then press the ignition button. Get home or go to the store and replace that battery immediately! If you don’t have any extra batteries at home, I would order some just in case. If you have a Lexus, you can get a bunch on Amazon here for cheap. Dulles (IAD) is installing new video screens to let travelers know what the expected wait time is to pass through security lines. The technology, provided by French-based software maker Blue Eye Video SA, uses video recognition analytics to measure the number of people in line, how long it is taking people to complete the security screening process, and a calculation of how fast the line is moving. You can also check the website to see the current security wait times even before you get to the airport. This is a pretty cool feature that should let you know how much time you might need if you’re ready to leave for the airport soon. I saw the Nest online a few months ago. If you haven’t seen it, it’s a pretty cool thermostat. Actually, it’s a programmable thermostat that is WiFi enabled so that you can connect to it from basically anywhere. It also has mobile apps available that allow you control it from your iPhone or Android devices. The nest comes in a nice little package. Aside from the unit itself, it’s contents includes literature, mounting plates, and a thoughtful little screwdriver. Installation was very easy and straight forward. First I turned off the A/C unit using the switch located next to it. You can also cut off the power by using the breaker. Then I detached all the wires and removed our old thermostat. Then I mounted the Nest’s metal mounting plate and attached the base. Then I attached all wires which are easily identifiable by color. Next, I snapped the unit on to the base and turned the A/C unit back on. The Nest uses the HVAC power lines, so it does not require any batteries. Once powered up, the Nest takes you through the initial setup. The first task is to setup the WiFi connection. Have your network password handy. Scroll through letters and options by turning the dial and enter/submit by pressing the unit in. Then it’ll ask you about your HVAC system and location. The whole installation took about 15-20 minutes. I immediately downloaded the iOS app from the app store. You can manage the Nest from the app and from a web browser via nest.com. I elected to use the web to setup the scheduling. It was a little easier for the initial setup. I still prefer doing things on my PC or Macbook over using apps on my iPhone or iPad. I appreciate product design and this is a beautiful little gadget. It’s much more interesting than your typical plastic thermostat. I think it could stand to be a little smaller though. If I had time, I would remove the plastic mounting plate but that will require me to patch up a small part of the hole that was made for the original thermostat. That would also require downtime for the air conditioning while the plaster and paint dry. It’s a little too hot for that right now. Scheduling won’t be any different on weekdays than before, but it should prove it’s usefulness on the weekends especially when we go out of town. I can just use the app to let it know we’re away or just before we plan to be home so it can adjust the temperature accordingly. The Nest takes a week to learn your habits so it’s too early to give a full review about it but my initial thoughts are I’m impressed.